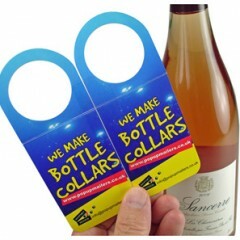 The Bottle Balls Bottle hanger enhances any	drinks marketing campaign by attracting attention. 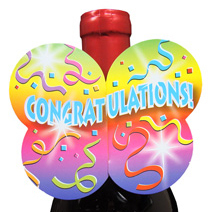 Similar to a flag in shape the Bottle Banner is attention-grabbing and attractive. 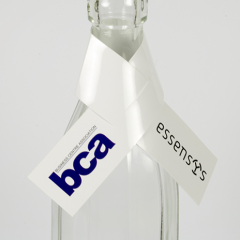 The Bottle Bow is available in a variety of shapes. 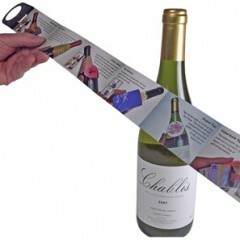 The collar offers a slim fit around the bottle neck whilst the tie hangs down. 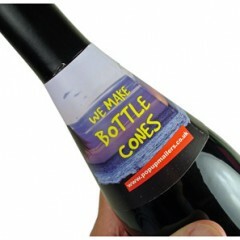 The Bottle Cone has a 360 degree display area and can be custom-made to sit perfectly on all shapes of bottle necks. 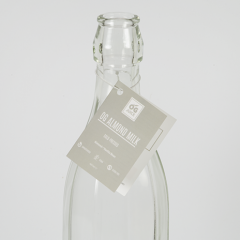 The Bottle Dissolve is novel and captivating and has a moving picture as the key feature. 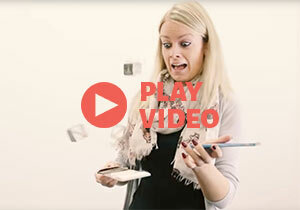 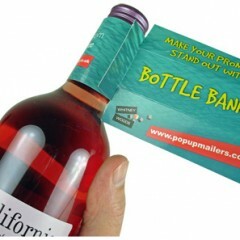 The Bottle Foldilocks offers versatility for any bottle marketing campaigns. 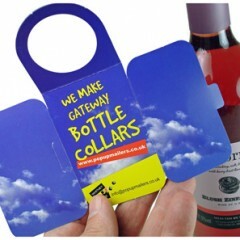 The Gateway Bottle Hanger is a bottle hanger with two panels that open up like a gateway to reveal a third panel inside. 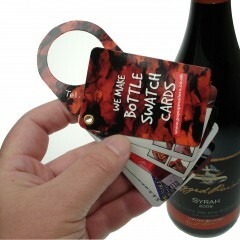 The Bottle Card Holder is a perfect mix for Brand Marketing and drinks promotion campaign. 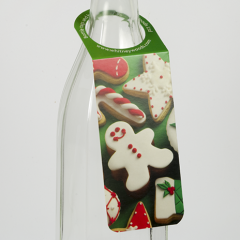 A Standard Bottle Hanger is a simple design which is easily slipped over a bottle neck to attract interest. 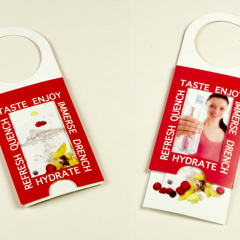 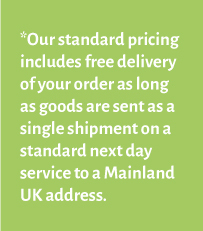 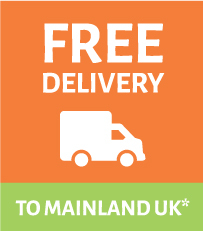 This Double Hanger style with a bottom fold can be customised to reflect any drinks marketing campaign. 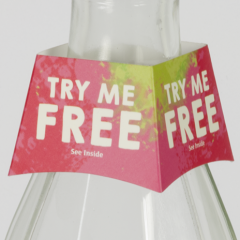 This double hanger with the side fold is very eye-catching, it adds extra dimension to bottle marketing. 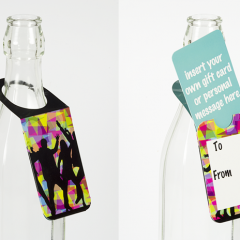 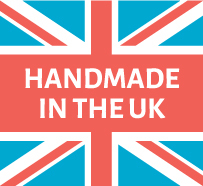 The Luvvy Label is a very unusual bottle tag that wraps around the bottle neck snugly. 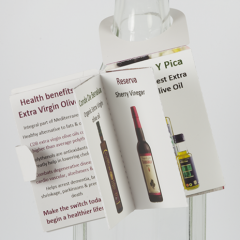 The Bottle Roll Fold is a mini brochure style consisting of perforated credit card sized panels. 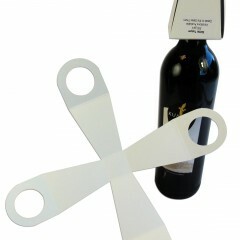 Bottle Hanger Hand is a great way to present beer bottles or smaller bottles for advertising and marketing purposes. 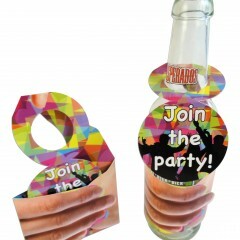 The Bottle Starburst is a bottle hanger with an attention-grabbing folded inner section. 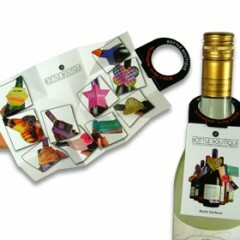 The Bottle Swatch is an interactive bottle hanger offering lots of potential for on pack promotions. 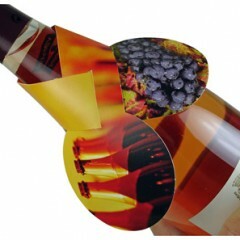 Single Bottle Tags have stood the test of time for bottle promotions and marketing liquor. 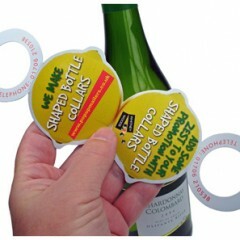 The Bottle Topper is an unusual bottle advertising format that sits over the bottle neck instead of hanging around it. 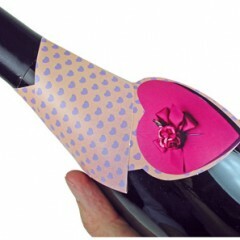 The Bottle Tower is a tried and tested bottle collar that has been around a long time.